A broad coalition of campaigning groups is launching a new report on High Speed Rail, setting out what still needs to be done by the Government to meet its commitment to local communities and the environment. When the Right Lines Charter, supported by environmental, transport, heritage and legal charities with over 600 combined years of involvement in the planning of major infrastructure, was launched in April 2011, then Secretary of State for Transport Philip Hammond said that ‘[these] respected organisations…should be assured that the Government is already acting on their points of concern.’ Over half a year later, on the verge of the Government announcing its decision on High Speed 2 (HS2), these organisations are launching a report to set out for the benefit of the new Secretary of State, Justine Greening, what still needs to be done. Besides setting out the need for such a strategy by 2014, before phase two of HS2 is formally consulted on, the report outlines how changes are needed to the way the future is forecasted and how communities are engaged in consultation on major infrastructure proposals. It also calls for better recognition and protection of the value of the natural and historic environment. The groups are calling for the lessons from previous schemes, such as High Speed 1, to be learned from. and high speed rail lobbying company Greengauge 21 has announced that three of the Right Lines Charter signatories have commissioned it to look at high speed rail and carbon emissions. A research study into the potential full carbon impacts of HS2 has been commissioned from Greengauge 21 by the Campaign to Protect Rural England (CPRE), the Campaign for Better Transport (CBT) and the Royal Society for the Protection of Birds (RSPB). This report sets out the interim findings, highlighting the issues that we have identified as likely to be significant in the carbon case for HS2. The report is an interim document ahead of the full results of the research, which will be published in 2012. In the next phase of the study will examine the knock-on effects on other modes of transport, examining for the first time the carbon impacts of freeing up capacity on existing railways for more rail freight or local passenger services, and identify the policy measures that will have the most impact on the carbon emissions for high speed rail. 1. The research study, The Carbon Impacts of HS2, is being carried out by Greengauge 21, a not-for-profit research organisation on high-speed rail. Greengauge 21 has in turn commissioned various experts in the environmental and transport fields and coördinated the research programme. 2. The Carbon Impacts of HS2 was commissioned by Campaign for Better Transport, Campaign to Protect Rural England (CPRE) and the Royal Society for the Protection of Birds (RSPB). The groups are all signatories of The Right Lines Charter, which was launched in April 2011 and which ten other organisations have now signed up to. It sets out four principles for ‘doing High Speed Rail well’, including highlighting the need for high-speed rail to be planned and justified as a strategic element of a sustainable, near zero carbon transport system. 3. The Carbon Impacts of HS2 is sponsored by Siemens, Systra and the Association of Train Operating Companies (ATOC). A new strategic and transparent approach is needed for High Speed Rail in an increasingly uncertain future. Assumptions about future transport policy and trends need to be exposed to scrutiny, taking account of possible technological changes as well as changes to the cost of different forms of travel. Centro‘s Geoff Inskip claims that HS2 would release “huge capacity” on the West Midlands rail network, for more and better local services. But the sum total of its capacity relief is: removing *one* Pendolino path per hour from the Birmingham – Coventry line. In previous blogposts, I discussed the transfer of London – West Midlands intercity rail traffic to the Chiltern Main Line. The diagram above shows the reconfiguration of services supporting this ‘Evergreen++’ concept – which is scalable, resilient, environment-friendly, and less expensive than HS2. provides the potential for through (no-change-of-train) service between London and Black Country towns such as Walsall and West Bromwich. The Black Country accounts for around half of the population of the West Midlands Urban Area. Because there is no change of train needed for Black Country towns, Evergreen++ is able to compete with HS2 on journey times to London. The Evergreen++ concept is about providing versatile, resilient, and interoperable infrastructure. The upgrade and electrification of the Coventry to Leamington Spa railway maximises realisation of these objectives. However, it’s likely that the West Coast Main Line could continue to be used for Coventry services, by splitting a future interregio-type service on the WCML, at Rugby. Intercity trains would not run from London to Birmingham on the WCML, however; their paths would be freed for other use. On the West Coast Main Line, upgrade works (e.g. junction grade separation) could robustify capacity between Euston and Milton Keynes. But it’s also possible to provide a second access to southern Milton Keynes, by extending passenger services from Marylebone beyond Aylesbury, using part of the Oxford – Cambridge Varsity Line. Given the scale of the funding required, it’s apparent that High Speed Two (£17+ billion for phase one alone – just between London and the West Midlands) would crowd out other public transport schemes. Unlike HS2, these schemes would benefit the whole of the country. Put another way, the opportunity costs of HS2 are immense. What could be funded with £17,000,000,000? The £17 billion for HS2 phase one doesn’t even include the cost of a station at Heathrow; in 2010, the cost of routeing HS2 into Heathrow was estimated at £2 to £4 billion extra – which is more than the estimated cost of electrification all the way from Swansea to London. All of which, of course, is absolute drivel. Big fixed-formation HS2 ‘classic compatible’ trains are not going to be a viable proposition on Crewe to Holyhead, or the Midlands to Aberystwyth. If HS2 is funded, there’d be precious little money left for any transport improvements within Wales. Naples has a high speed rail line to Rome, and northern Italy. But it hasn’t turned the Mezzogiorno into Europe’s boom region. Thanet, in Kent, remains one of the most depressed areas in England, although it’s served by direct High Speed One services to London. A favourite buzzword of Centro, the West Midlands Passenger Transport Executive, is ‘connectivity’. So it’s unfortunate that it has spent £70,000 of public cash on myopic lobbying for High Speed Two, whose two West Midlands stations would be poorly connected to existing transport links and urban centres, providing no benefits to most of the populace. For a London to West Midlands journey, the headline time benefit provided by High Speed Two would be (at most) just over 30 minutes. But its dead end Birmingham station at Curzon Street would be for high speed trains only, and the HS2 plan does not provide for through trains to other West Midlands boroughs. Curzon Street is on the southern periphery of the city centre, and not particularly well located with respect to the central business district. Depending on the locale, HS2’s West Midlands time advantage over the situation as-is, would be a lot less than 30 minutes, zero, or negative (e.g. for Coventry). On inspecting the population distribution and transport links, it turns out that HS2 would provide no measurable time advantage for most West Midlands residents; as the additional (transfer-to and waiting-)time at Curzon Street exceeds half an hour, HS2’s higher speed is nullified. The site of the HS2 ‘Birmingham interchange’ at Bickenhill, is in Solihull borough, but difficult to reach from Solihull town centre. The train operating company on the existing Chiltern Line has progressed various upgrades under the names ‘Evergreen 1’, ‘Evergreen 2’ and ‘Evergreen 3’. 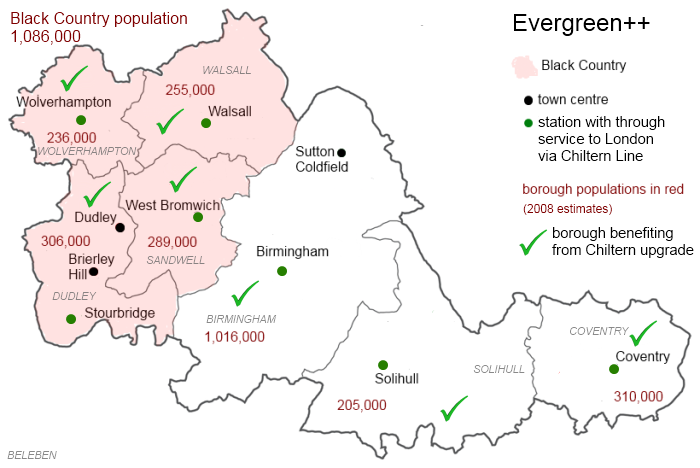 A further development to ‘Evergreen++’, with express electric trains, would provide Black Country, Solihull, and most Birmingham residents, with a quicker service than HS2, without the latter’s outsize carbon footprint. 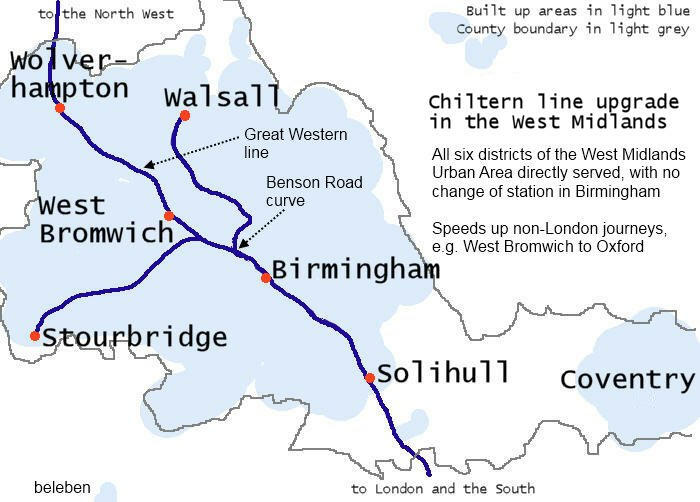 The populous (western) part of Solihull borough would also get a quicker-than-HS2 service, negating need for a road journey to Bickenhill, or a train into Birmingham. HS2 Ltd has given a time of 49 minutes for a Birmingham to London journey. But, by leveraging through trains and better distributed stopping points, Evergreen++ could outperform HS2 for most people and destinations in the West Midlands. The only locations where HS2 has an advantage are the localities adjacent to Curzon Street and Bickenhill, but the isochrones are remarkably close to these stations. The Snow Hill site is unencumbered by platform length or curvature issues, and its location, within the traditional city centre, is nearer the central business district. In principle, it would be possible to expand the station, as and when necessary. The principal obstacle is Centro, which wants to run its ill-starred Midland Metro tramway along a ramp built right against the east side of the station. This tramway is the principal impediment to improving transport links in the wider region. About five kilometres to the north, Midland Metro blocks construction of a chord to the Soho loop railway. This chord – the Benson Road curve – would unlock part of the potential of the Great Western route through Snow Hill, for northbound traffic. In avoiding use of any part of the West Coast Main Line trunk from Euston to Staffordshire via Nuneaton, this upgrade would preserve options such as running some trains from London/Leamington to Birmingham, via Coventry.